Abalon Foundation Repair’s highly trained estimators will design the right sump pump system for your project. We have a specially designed pit to maximize the collection of water, and will install a sump pump system on time, on budget, and to your complete satisfaction. Sump systems are a collection point where water can be collected and then pumped out to a required area. 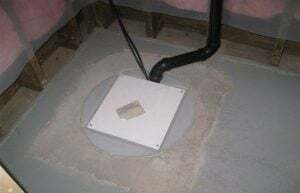 Sump systems are typically used in homes and buildings to collect water from a drainage system (weeping tile) from trenches or simply to collect water under a concrete slab. What sets Abalon Foundation Repair apart from our competitors is our ability to take all of the pertaining information including the way the building was engineered, constructed, and behaving into account, before a very specific design of your sump system is done. If the sump pump system is not located where it needs to go, you will not be successful in managing the water. The average sump pit depth in the industry is 24 inches. Abalon Foundation Repair only uses pits that are a minimum of 36 inches deep. It is important for the bottom of the pit to be lower than any services that may come into your home or building. Typical sewer line depth is about 18 inches below the finished concrete floor. This way we can ensure that all the water is captured underneath your basement floor. Abalon uses Hydromatic Sump Pumps, the undisputed best submersible pumps that come with a full 3-year warranty, almost double the industry average. I have a sump pump that goes off every 10 minutes when it’s raining, it’s in the middle of my basement in a 5-gallon bucket. When I look in my sewer clean out I can see that it is full of water, what’s wrong? Your sump system should be next to your sewer line clean out against the exterior wall. It sounds like your pit is not deep enough and the pit should be a proper sump pump pit that includes a lid to keep kids and things out. I own a home in Calgary in the community of Edgemont. My house does not have weeping tile. When it rains for several days I can see water coming out the sewer line clean out box, and it floods my basement floor, what do I need to do? It sounds like water is coming in via the sewer line trench. A sump system installed next to the clean out box is most likely all you need. We have the leading industry team to get your project done on time, on budget, and to your total satisfaction. Trust us – we will put a smile on your face GUARANTEED.